OBSTACLES is a top-down 2d driving game that started life as an entry for the UL Gamejam held on November 3rd 2018. It’s available as a browser game playable with a keyboard or controller on itch.io. 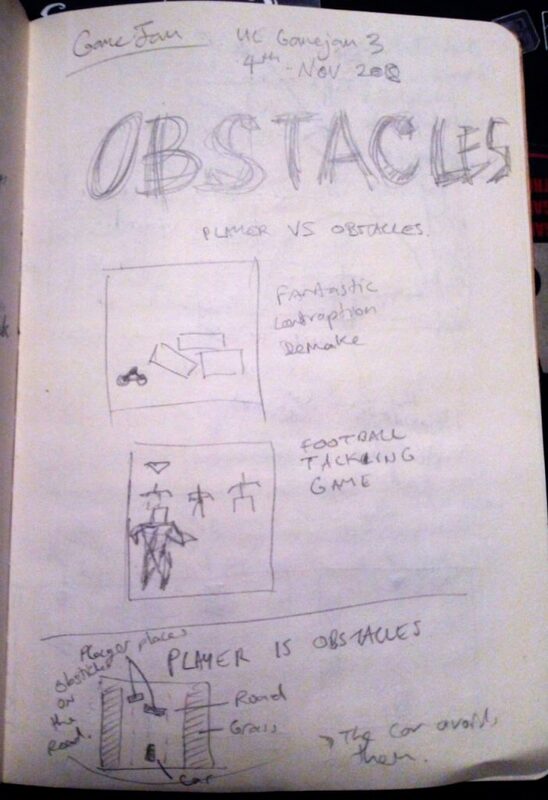 The gamejam theme was “Obstacles”, hence the game name. I sketched a few ideas for games and settled on an idea that became this game. The idea was that the computer plays as the car and you play as a monster/wizard that is throwing heavy objects on the road to cause the robot car to crash. With the pressure of time, and maybe a little too much time trying to figure out lanes and such, I decided to go simpler and elected the current design. Here’s a bunch of design notes made during the gamejam, it may give you a sense of how I came to make the game. 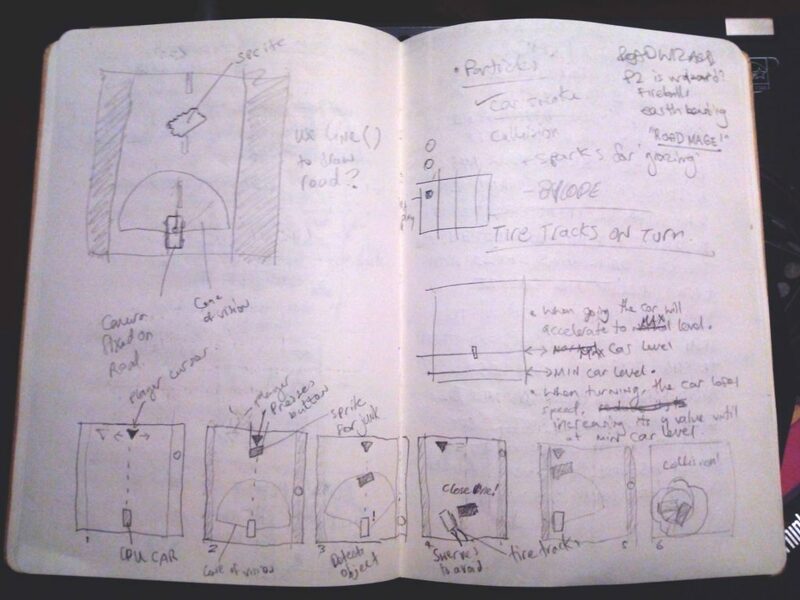 The notes feature my initial design ideas and a bit of figuring out how to do collision for the game. Ultimately it is quite beneficial to have a team – creation is a collaborative effort and you can ultimately make a better game when you have a bunch of people who are contributing towards making a ‘good’ game. Rather excitingly, a lot of the folks who attended my PICO-8 workshop ended up making games using PICO-8, and they are a lot of fun! Unfortunately, much of the games that were made are not yet on itch.io. They had submissions on location at the jam site, followed by a presentation and playing each other’s games. In my experience, most people would seldom return to their gamejam game after the jam, but there might be more submissions to the jam page to upload those games that are missing. I felt that I missed out a bit. Having given the workshop, I wanted to be there just in case anyone had questions and to offer support. While I was remotely participating from Galway, I got to walk and mind two lovely little dogs because their owner was away. I’m glad I was able to do that, and I’m very grateful that the Game Development Society and the gamejam organisers arranged a Discord Server and online submissions. Their efforts enabled me to participate fully in spite of being in another county. I hope everyone had a good time, and that anyone who used PICO-8 enjoyed their time using it. I look forward to playing their games. During the next week or two, I plan to work on this game a little more. Let’s see what happens.